Raf Simons’ paved the front of the Louvre’s Cour Carrée with a multifaceted mirror that distorted the immaculate lines of the building’s classical 18th century façade. The same kind of twisting occurred once inside the show, where the clothes were imbued with - at least in historic terms - a split personality. The 18th century provided fertile ground for Simons’ remixed influences, from the rural countryside to glamorous court palaces, which manifested themselves in a variety of silhouettes, cuts and materials. Circle skirts came reared with humped backs; dresses were trimmed in rows of microscopic fabric buttons; sleeves had the pomp of court dress; while velvet gilets tumbled to the ground like grand, sweeping frock coats. 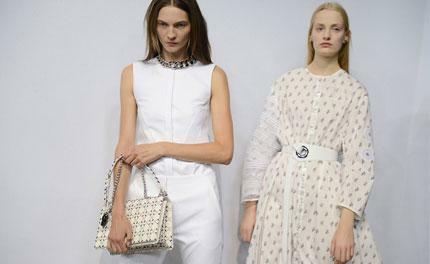 Most intriguing, however, were the more humble iterations of that period, like a calico print cotton that was cut into modern shapes and paired up with 1980s-style black tailored separates, or the old-fashioned nightgowns that found new life as crispy, airy cotton dresses. Simons anchored his looks with witchy-looking boots constructed from knitted sock uppers. The best looks in this collection, however, were those where Simons’ icy modernism popped out: the micro jacquard suiting was excellent as were the figure-hugging button-trimmed ¾ length skirts, paired with turtlenecks and lace tops.